In a first in the country, AIIMS doctors have carried out Bicruciate Substituting (BCS) Knee Replacement surgery in which an advanced implant is used to restore the normal motion of a knee, ensuring a more natural movement than that achieved by conventional surgery. The advanced technique for knee treatment was introduced in the presence of Alfred Tria, Chief Orthopaedic Surgeon from St Peter’s University Hospital, New Jersey who is the designer of the implant. According to Dr Rajesh Malhotra, Professor (Orthopaedics) and Senior Joint Replacement Surgeon at AIIMS, conventional knee replacements do not meet the need for higher functionality, improved motion or long-term durability. “Knee joint is made up of thigh bone and shin bone with a knee cap in front. The two ligaments inside the knee joint called cruciate ligaments cross each other to form an ‘X’, Called the anterior cruciate ligament and the posterior cruciate ligament, these control the back and forth motion of your knee. “In the current knee replacement procedure, doctors have to cut the cruciate. Doctors cut both the ligaments but substitute the function of only one which results in a kinematic confict and the knee movement is not natural,” Dr Malhotra said. Although conventional knee replacement is a very successful operation, about 15-20 per cent patients often are dissatisfied with their knee as they face difficulties in carrying out daily activities and complain that the knee doesn’t feel normal. BCS knee replacement implant, Dr Malhotra said, has two important features-firstly it has a distinct design which allows the near natural movement of the knee and secondly it is made of a material combination which has been shown to be durable in laboratory testing. “Made up of oxinium and zirconium with an oxidised surface, the durability of this implant is 30 years contrary to the current implants which have a durability of 15 years. “Also, women may be allergic to some of the components used in the conventional knee replacements because of the presence of nickel and cobalt. 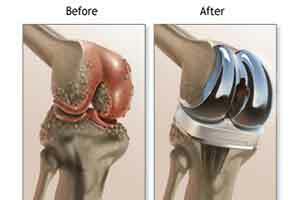 The metal allergy can cause pain and early failure of the artificial joint. One of the advantages of oxinium is that it doesn’t cause allergy,” he said.